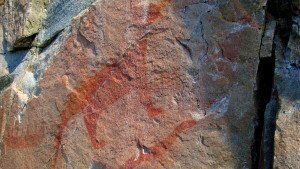 One of the most famous pictograph sites in Canada is found in Agawa Bay, within Lake Superior Provincial Park. The Agawa site is one of the most visited indigenous archaeological sites in Canada. The majority of paintings from the Agawa site are said to date from the 17th and 18th centuries. Agawa Bay is located approximately 135 km north of Sault Ste. Marie along highway 17. There is a sign at the highway to direct visitors to Agawa Rock. From the parking area you will find signs leading you to the short trail to the pictographs. The trail to the site of the Pictographs is short, but very rocky and rugged. The trail passes through rock chasms, broken boulders and sheer cliffs. You will have to walk out on a ledge to view the pictographs. The pictographs can only be accessed when the lake is calm. Caution is advised when venturing onto this rock ledge due to its slope and the unpredictable nature of Lake Superior and its wave action. The trail is open from mid-May to mid-September.